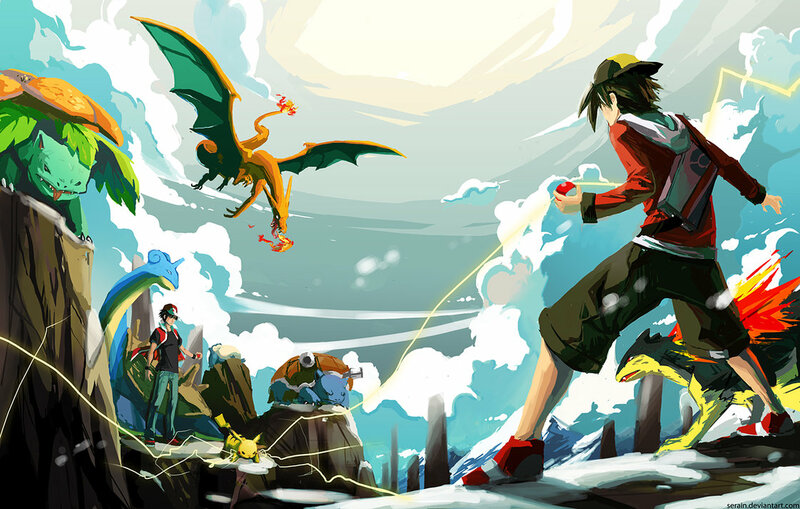 I see a lot of fan arts like this one, a trainer challenging red. He always has a Typhlosion but I have never seen the other of his pokemon in any fan art. It seems like this place is Mt.Silver. Where is he originated from? Games, anime, manga? This character's name is Gold. Like Madara mentioned, he is the main character in Gold/Silver/Crystal. He is most likely from the Pokemon adventures manga (which I read). The one facing him is most likely Red from the manga as well. I just do not remember him having a Lapras, but I do know that at the Deoxys arc of the manga he used all 3 of the Kanto starters at some point. In the manga, Gold's team would be Sudowoodo, Ambipom, Sunflora, Politoad, Togetic and Typhlosion (as of Volume 43). He has a Pichu called Pibu, but it's more or less there for cute appeal. This scene is most likely drawn to depict their training at Mt. Silver, or in the game where Red is like the "final boss" of HG/SS. That would be the main character in Gold/Silver/Crystal. In Generation II he had no official name (and so was unofficially known as Gold), but was given a name in the Generation IV remakes to Gold/Silver, and was given the name Ethan. He could also be Jimmy from "Pokemon and The Legend of Thunder!" It was a three part episode/movie in the Pokemon chronicle series. Jimmy did have a Typhlosion, he also was shown to have a beedrill. He came from newbark town in the Johto region and chose a Cyndaquil as his partner. He is the main character in Generation II Pokemon Gold/Silver and the male character in Pokemon Crystal and their remakes in Generation IV HeartGold & SoulSilver, Ethan. It's also known as Gold in Generation II. He is also the main protagonist in The Legend of Thunder!, known as Jimmy. Both Jimmy and Ethan is from New Bark Town in Johto. The image is more like Ethan from the game, because he fight Red where the player can fight him at the top of Mt. Silver after beating Elite Four and Champion and also have all 16 Badges from Johto and Kanto.